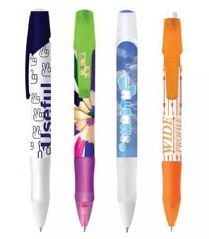 Most Custom ballpens usually have limitations. If you're on this page itself, the chances are that you want a promotional ball-point pen that can be personalised exactly to preference rather than mediocre. Opaque or frosted, chooce over a staggering array of colours to sport and them your Company brand name to, and whilst you're at it - why not customise the colours of the clip, grip, plug and section with a 20 colour choice!! Personalisation doesn't get much better than this! 76.6 x 43.6mm print area! For a FREE QUOTE, please fill in the form regarding our Personalised Full Colour Digital Print Pens and we'll be able to help you.